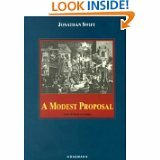 This is a study guide for the book A Modest Proposal written by Jonathan Swift. A Modest Proposal for Preventing the Children of Poor People From Being a Burden on Their Parents or Country, and for Making Them Beneficial to the Publick, commonly referred to as A Modest Proposal, is a Juvenalian satirical essay written and published anonymously by Jonathan Swift in 1729. Please click on the literary analysis category you wish to be displayed. Back and Next buttons can guide you through all the sections or you can choose to jump from section to section using the links below or the links at the left.